A new documentary has been made about the resurrection of the Wampanoag language which has a few screenings coming up next month in the US. DVD’s are also available and details of both can be found here. 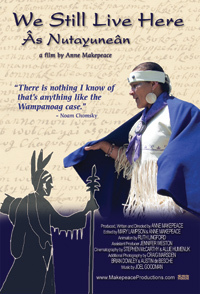 sent her and members of the Aquinnah and Mashpee Wampanaog communities on an odyssey that would uncover hundreds of documents written in their language, lead Jessie to a Masters in Linguistics at MIT, and result in something that had never been done before – bringing a language alive again in an American Indian community after many generations with no Native speakers. Although I haven’t seen the film it sounds to be very much in the same vein as “the linguists” which came out in 2008. The Linguists follows two field linguists as they travel to document and help promote the rescue of near-extinct languages. Oh man, thanks for all of the links! This is great. I really look forward to this film. I was in Massachusetts last summer and looked into going to the Wompanoag school, but I think you had to prove First Nation ancestry, which I don’t have. That was before Jessie Little Doe received the McArthur Genius Grant, though. Q: How do you say the Lord’s Prayer in Massachusetts? A: Nooshun kesukqut, wunneetupantamuch koowesuounk. Peyamooutch kukkeitasootamounk. Toh anantaman ne n-naj okheit, neane kesukqut. Asekesukokish petukqunnegash assaminnean yeu kesukok. Ahquontamaiinnean nummatcheseongatch, neane matchenehikqueagig nutahquontamanóunonog. Ahque sagkompaguninnean en qutchhuaonganit, webe pohquohwussinnan wutch matchitut. Newutche keitassootamoonk, kutahtauun, menuhkesuonk, sohsumoonk micheme kah micheme. Amen. On a completely different thread of ‘wampanoag’, I recently ran across the tribe studying Civil War ships. The USS Wampanoag was the nation’s first and most famous Civil War cruiser and a one-time flag ship for the North American fleet. It could go a blistering seventeen knots which made it the fastest warship in the Civil War. No ship beat that speed in the Navy Sea Trials for twenty-one years. so there’s a bit more breadth to the name.